This cap takes the classic ’85 colorway and mixes it with the ’91 interlocking SD to great results. The orange brim really makes this cap pop. I don’t normally keep the stickers on my caps; I haven’t had the opportunity to wear this one yet. On the wearer’s right is where you’ll find the World Series patch. 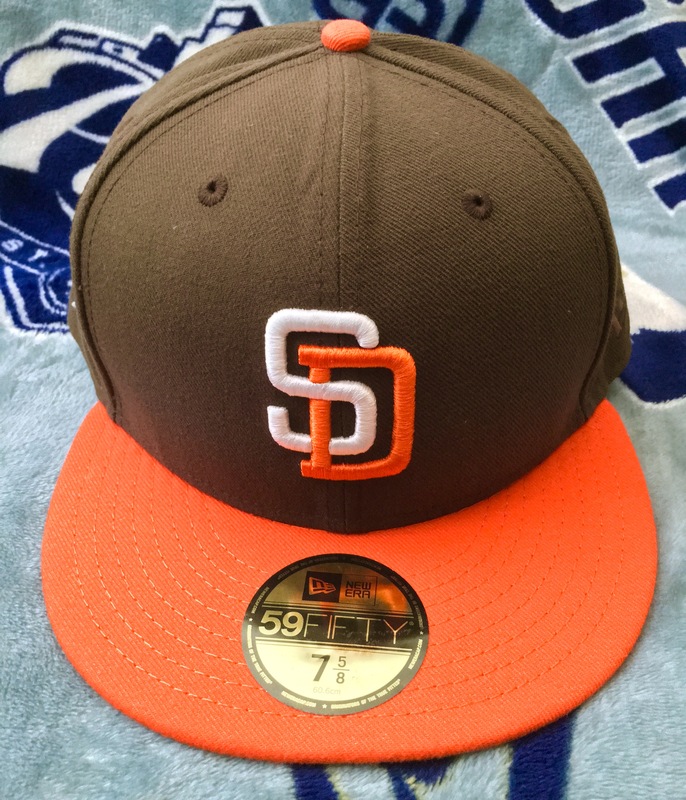 This patch appears commonly on Padres caps though it wasn’t the patch worn on-field during the Series; that particular patch was a different design. The MLB Batterman logo is done up in brown and orange with a brown border. The underbrim and sweatband are classic colors: gray and white. While I do appreciate the time-correct colors, I don’t particularly care for white sweatbands; they’re too prone to sweat staining and yellowing. This cap used to be sold on MyFitteds, though they only have one or two sizes left as of this writing . The cap in my collection is an eBay find.